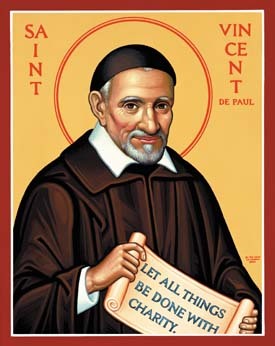 Vincent de Paul was born in France in 1581 and as a priest dedicated himself to serving the poor until his death in 1660. He was canonized in 1737 and is venerated today in both the Roman Catholic and Anglican Church. In 1883 a twenty year old student, Frederic Ozanam, founded the St Vincent de Paul Society as a way individuals could put their faith into action. This compassionate outlook, enthusiasm and vision continues in many countries today when thousands of people share their time, care for humanity and energy to make a difference in the lives of disadvantaged people. Brigidine Sisters support in various ways the work of the St Vincent de Paul Society in the parishes and places where they live and minister.